Earlier in the year, Bus and Coach Buyer reported on the BUSFORUS App developed by Rise Digital Media and piloted by Metro, First Bus and Arriva in Leeds. Now the company has taken the system development a stage further to produce an onboard passenger information system using mobile data technology. 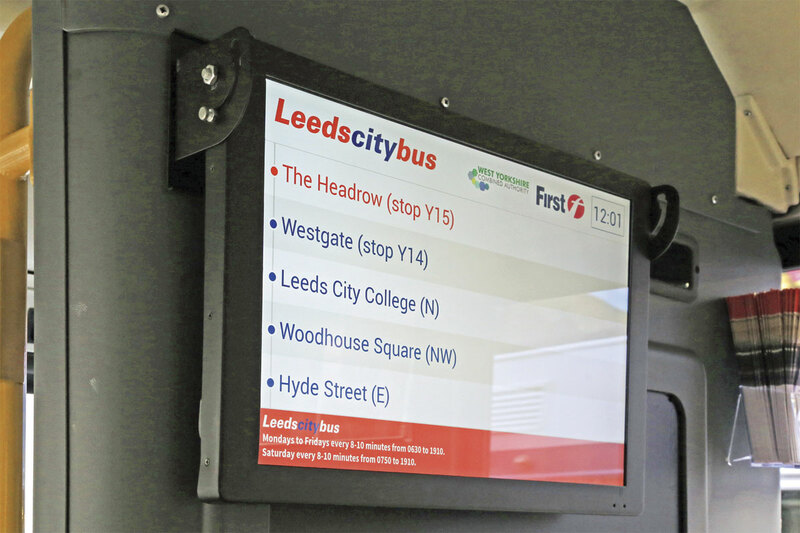 Intended to make travel easier for the blind and visually impaired, an eight week pilot of the new NextStop system has been launched by First Bus in partnership with the West Yorkshire Combined Authority (WYCA), CPT and the system developer. Three Optare Solo vehicles owned by WYCA have been fitted with the product and will operate on the LeedsCityBus. The service is provided by First Bus and links key locations around Leeds city centre at a flat fare of 50p. As a control, the system has not been fitted to the fourth vehicle on the service. The NextStop messages were clearly audible to visually impaired customers at the front of the vehicle. Feedback forms are provided in a dispenser to the right of the screen. Speaking at the launch of the pilot to a receptive gathering of local press and user groups, Paul Matthews, MD of First West Yorkshire stressed the company’s commitment to inclusivity, ‘We are committed to making our services as accessible as possible to all our passengers. We are therefore excited about this pilot, which we think has the potential to revolutionise bus travel for all passengers as well as the blind and visual impaired community.’ Paul strongly encouraged all present to spread the message about the importance of feedback on the pilot to drive the system’s further development. 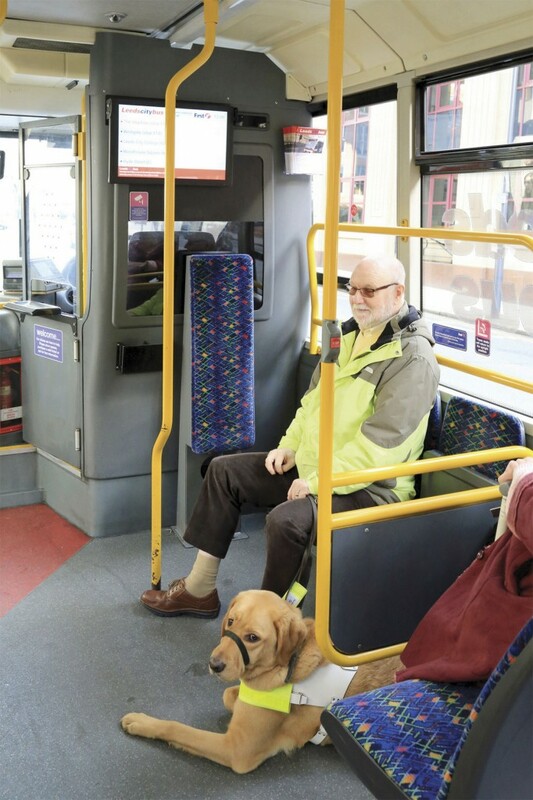 For WYCA, Transport Committee Deputy Chair, Cllr Eric Firth, referred to NextStop as a win-win for everyone, benefiting not just blind and visually impaired passengers but also those with learning difficulties and dementia. He thanked First for their commitment to the pilot, noting that on board passenger information had been the subject of debate at the most recent Transport Committee meeting. They had received a delegation on the subject from user groups at that meeting and concluded that it needed to be embraced by all operators. Moving to the technical aspects of the system, Scott James, MD of Rise Digital Media, referred to the 18 months of development already invested in the system and the commonality of the data processes with the previously trialled app. Where NextStop differed from conventional integrated systems was in its simplicity, ease of installation and ultimately affordability. All the mobile phone based technology is built in to the screen unit that, in the case of the WYCA Solos, is installed facing rearward on the driver’s bulkhead. There is more flexibility for installations on door forward vehicles where either the bulkhead or stanchions over the front wheelarches could be used. The only connection required to the vehicle is for the power supply to the screen, any update or change to route programming, for example when diversions are required or stop names changed, is done remotely via the SIM card built into the unit. The NextStop screen with speakers built in either side is neatly installed on the Optare Solo driver’s bulkhead and connected to a locally available power supply. In operation the screen displays a list of future stops with the next stop highlighted in an alternative colour. At a predetermined point recognised through the built in GPS link, the name of the next stop is audibly announced. For the purpose of the pilot, only one announcement is made per stop and the vehicles feature either a male or female voice to determine whether this impacts on customers’ perception of the system. In series use, the system is likely to be used to carry additional audio and visual information such as details of connections or marketing of attractions and businesses close to the route. According to Scott, the system is fully scaleable to any fleet size, can be retrofitted to all existing vehicle types or installed in new vehicles and will cost significantly less than conventional systems with the added possibility of advertising sales revenue to offset the cost. The system normally needs no driver intervention and the latter have no opportunity to turn off the system, an issue encountered in the early days of London’s system. Paul Matthews confirmed that all the drivers on the LeedsCityBus rota were fully engaged and supportive of the project. The launch concluded with a demonstration circuit of Leeds city centre in service, using the vehicle with a female voice. With a large contingent of press and user groups on board, not forgetting at least three assistance dogs, there was a significantly higher than normal level of noise internally and some tuning in was required to pick out the next stop message when sitting to the rear of the vehicle. The up to ten year old Solos are also not the quietest or smoothest vehicles around and it was noted on several occasions that the announcement of the next stop coincided with the vehicle accelerating. Talking to one of the visually impaired passengers sitting near the screen, he confirmed however that the next stop messages had been received clearly. Increasing the volume may make it intrusive, particularly for the driver, so the option of providing an additional speaker or speakers towards the rear of the vehicle is already being discussed. With the benefit of wireless technology, the speakers will also only require a power connection. Generating feedback is key to the success of the pilot. First have produced a feedback form that is available from a dispenser alongside the screen on board the vehicles with large print and Braille formats available on request. Feedback can also be provided online or by telephone. With the service running every eight minutes from 06.30 to 19.10 Mondays to Saturdays, a large and diverse customer population is expected to experience the NextStop system during the eight week pilot. Organisations specifically asked to test the product include Guide Dogs and Visit Leeds. Four branded 2006-7 Optare Solos are dedicated to the LeedsCityBus operation. The illuminated NextStop screen is clearly visible inside. Initial feedback generated from the demonstration circuit included not just system related aspects such as volume levels and screen colours for the partially sighted but also content requirements. Participants highlighted the need for the stop name to be relevant to the location served rather than just a street name and for the actual alighting point to be referenced where the vehicle may have stopped a number of times in traffic since the next stop was announced. 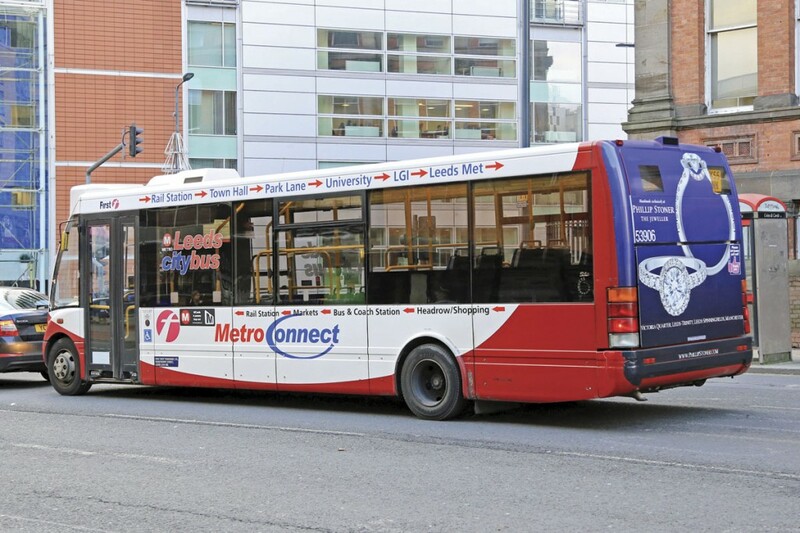 In developing BUSFORUS, Rise Digital Media overcame the challenges presented by Leeds’ crowded urban environment to produce a reliable mobile data based system. Customers who used it during the pilot spoke positively of its impact but its outreach was limited to those having access to and the capability to use a smartphone. NextStop takes the same technology a stage further and opens it up to a much wider audience, not just those with visual impairment but also anyone lacking in confidence to use public transport or simply without local knowledge. The demonstration ride highlighted a number of aspects which could further improve the product, hence the focus on ensuring that as much feedback as possible is generated during the pilot. Providing a cost effective retrofittable solution such as NextStop is essential if there is to be a step change in the widespread provision of on board passenger information.